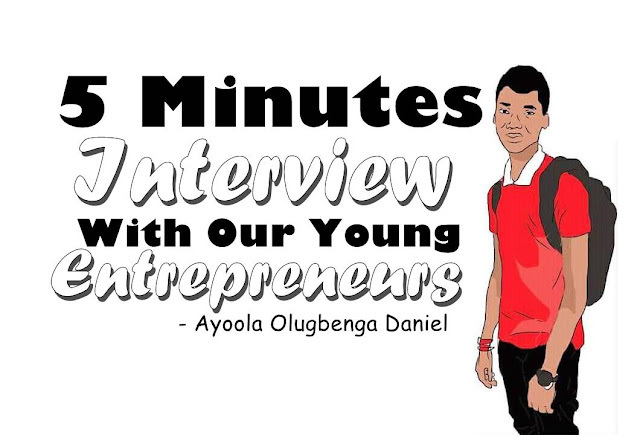 On today's edition of the 5 Minutes Interview With Our Young Entrepreneurs, we're hosting one of our young adults, Daniel Ayoola. We hope you enjoy it. If you wish to be featured, please go here! author is John Maxwell, the author of Developing the Leader Within You! I like to meet with people, especially girls and people who do what's related to my culture. I listen to ASA, Adekunle, and Kiss Daniel songs alone. I am who I am today by my ability to surround myself with friends who are smarter than I am. Editor: Would you mind sharing a little description of your business and the business address with us? Entrepreneur: Right from Senior Secondary 2 (SS2) 2015, I felt challenged when a guy told me he has website that pays him when people visit his website. I took my time to make findings on the net with the Symbian Phone I used back then (E63). I later found out that it wasn’t a website but a blog. However, I find creating a blog and posting 2go related stuffs a hobby, I later moved to blogger and made $26.3 for two years because I was not blogging the right way. People didn’t visit my website because I post copied contents from LindaIkeji’s Blog. I later moved to WordPress after meeting with the CEO of Talk Glitz TV, an entertainment blog of which I’m now an author. Wole of Talk Glitz Media tutored me on blogging for over 6 months and ever since then, I’ve been doing good with my reputable Admission List Blog. Entrepreneur: 3 things inspired me to embark on the journey of being an Entrepreneur! - I want to impact lives and make people connected to what will benefit them. - I want to build projects that will be rival with big brands like Facebook and Instagram. - I want to be a billionaire programmer like Mark Zuckerberg. Editor: What inspires your work and what do you often find yourself doing? Entrepreneur: I read books a lot and listen to Asa musics, so I find it easier to curate contents easily with ideas I get from books that provides in-depth guide about a topic. What I found myself doing everyday is writing, surfing the internet and programming. Editor: What is your best quote, in terms of business and entrepreneurship? Editor: What are the most important entrepreneurial characteristics and skills you think you possess? Entrepreneur: I learn everyday, I’m creative, I invest for a long term profit and I’m self-reliable. Entrepreneur: You know what! I don’t even know how to give an answer to your question. Entrepreneur: Apart from Programming and Blogging which involves writing, I have no other Job. Entrepreneur: Sometimes I prefer working alone on something I can do perfectly by myself and sometimes it will need the help of a team to get a job done quickly. I have a leading spirit, so working in a team won’t be a problem. Entrepreneur: If what you’re trying to ask his, how did I identify my audience and my targeted client? Well, I know for sure that the admission tips I share on my blog is meant for students of my age so I share whatever I write on my blog with friends building a network around that. On the aspect of programming, I identify my client through Google maps and Instagram. I checkout brands who are badly in need for an online presence, then Gbam! I’ll give them a call and forward my proposal. Majority have turned out to be good. Entrepreneur: I finished my primary school education in Jemsol Int’ School at the age of 10 and went to a public school, named Ijaiye Ojokor Junior High School where I spent 5 years before moving on to Senior school named - Ijaiye Ojokoro Senior High School. I finished my secondary school education at age 17, 2017. Now I’m an aspirant of Federal University of Oye-Ekiti (FUOYE) who wishes to study Computer Science because that’s where my passion lies. Entrepreneur: I saw what other entrepreneurs like Jide of OgbongeBlog and Wole of TalkGlitz Media does so I was really determined to have an influence and build networks like them. I started by investing on the long run - Buying a domain name and hosting it. On the aspect of programming, I saw what other programmers do and was really determined to make $$$ like them. So I went further by creating a brand website for my self, where I upload and write about my recent projects. Geeky Daniel. Editor: Do you identify, target and research your competitors? Entrepreneur: Yes I do! I see myschool.com.ng and currentschoolnews.com as a competitor, so I do everything possible to do what they do in another way because uniqueness pays the best. On the aspect of programming, I’ll say I have no competitor because tech companies and clients won’t ask for your grades or certificate, rather they’ll ask for what you can offer. I give my clients the best I can offer. Entrepreneur: The best way to earn money from blogging is to offer quality contents that proffer solutions to peoples problem, then later the money will start flowing in. On the programming aspect, be good with your language. Study your language, practice and create stunning projects! Your projects will talk for you. Entrepreneur: I saved money from the little I was given to eat and buy things for myself. Entrepreneur: I found out there are a hundred, even thousands other people who are trying to rank above my blog and who want’s to build web platforms for big and small brands. Entrepreneur: I find people who do what’s related to my culture via Instagram and Facebook groups. Entrepreneur: I charge clients less then after a while, I raise my rate knowing what I did was worth more than just building a website or writing. Entrepreneur: Yes, I tried advertising by commenting and leaving spammy links to what I do which didn’t pay out as expected. Sometimes, I’m either banned not to comment for a while or my account blocked. Entrepreneur: Oh! As at last year, there was no projects to show how good I was with developing websites from scratch. But now, I’ve gotten more than 5 websites to show my new clients. Entrepreneur: A lot will come back to me because I offer the best I can offer. Editor: Wow, thanks a lot for all these amazing answers, please permit us to digress a bit to you personal interests. What kind of music do you listen to and who are your favorite musicians? Entrepreneur: I listen to Asa and Adekunle Gold’s musics likewise Kiss Daniel. Entrepreneur: Neil Patel of Quicksprout, Harsh Agrawal of ShoutMeLoud, John Chow and Wole of TalkGlitz Media. Entrepreneur: Yes! I re-designed a brand website for my client - Gracefulagainghome.com.ng. My client saw this project as something that’s worth more than the fee he gave me. Editor: Where do you see yourself professionally on the next 3-5 years? Entrepreneur: I’ll be somewhere great by my ability to surround my self with people who are smarter than I am. By then, I’ll have been one of the most demanded developer in Africa. Entrepreneur: One of the biggest embarrassment I’ve faced, was not presenting my project at the right time and not keeping my client abreast of what I do until the project is finished. Entrepreneur: I’m the first born of my family of 5. I stay awake at night and this really causes trouble for me if my Mum found out that I was not sleeping, its either my phone is seized or she removed my PC’s battery. Entrepreneur: Be good and what you do now because you’ll be the best in that Industry overnight and not just the best, the most demanded. Entrepreneur: Oh! I’m so glad to be featured on Reporter247.org. I see this as a great opportunity to show the world what I’m best good at. Thanks to Reporter247 for this awesome talk series for young entrepreneurs. Entrepreneur: I want to tell you a very successful story. Once upon a time,You were born and now you are still existing, and in some few days from now you'd be fulfilling your dreams,making the nation proud and looking back at where you started and enjoying your success. You’ll be successful only when you want to succeed.